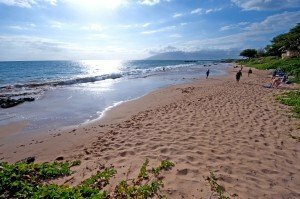 Maui Kamaole is located in sunny South Kihei, bordering Wailea. The Maui Kamaole resort has the “Wailea feel” with its beautiful, expansive 23-acre park-like setting. Numerous low-rise buildings are separated by green lawns and lush tropical landscaping. This is a renovated ground floor one bedroom two bathroom condo with an ocean view. It is set back from the road, making it very quiet and private with a spacious open feel. It comfortably sleeps up to four guests. • on-site tennis court: we provide two rackets and balls! The mile-long Keawakapu Beach is also within easy walking distance. Enjoy the beachfront view of multi-million-dollar Wailea mansions and high-end hotel complexes. Or snorkel with turtles and fish at Keawakapu’s famous reef located on the right side! 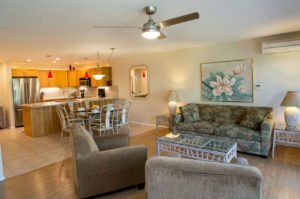 Unlike most owners at Maui Kamaole, our family lives in Kihei and we make a point of checking the condo before your arrival to make sure it is in great condition. You can contact us directly instead of dealing with a busy rental agency! Your newly renovated kitchen with stainless steel appliances! Cook a gourmet dinner or mix a maitai! Your private lanai off the master bedroom – perfect to escape the kids and read a book! Another look at the Queen-size Murphy bed down. With the Murphy bed folded into the cabinetry, this room is huge! 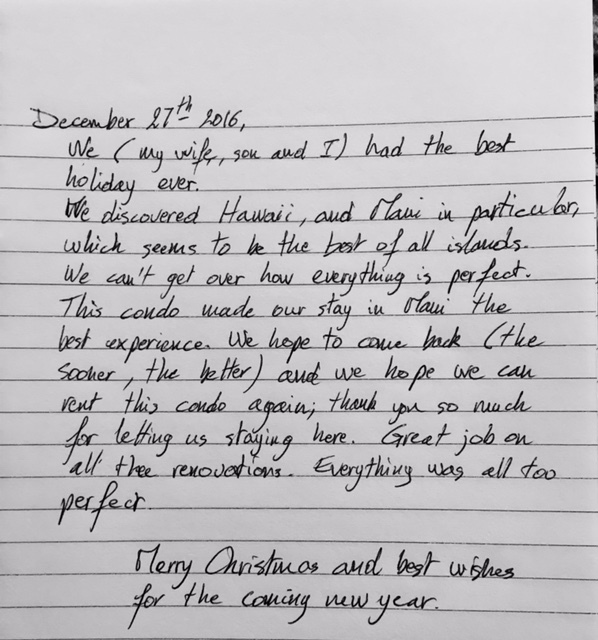 Guest Reviews for our Maui Kamaole I-103 condo! Great location, quiet, well cared for. Thoughtful with extras like beach accessories, books, kitchen supplies. 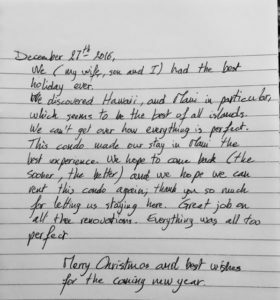 We’ve stayed at Maui Kamaole over the years for 13 weeks. We enjoyed this condo, very clean and no carpet which was a plus. The air conditioning was very comfortable and we’ve stayed at others that weren’t. The guest room shower was wonderful and large. Granite cabinet tops upgrades were really nice. Mattress was comfortable and unit was centrally located, just a short walk to the larger, very quiet pool. We love Maui Kamaole location because you can take morning walks on the beach right across the street. You will thoroughly enjoy this condo, it’s very clean, quiet and great location. This condo had everything and more than what we expected and needed. Travelling with a 5 year old and 8 month old isn’t easy but Cara and sig’s condo was awesome. They had a booster seat and pack n play as well as beach toys, pool noodles, boogie boards, beach chairs, coolers and umbrellas! The kitchen was stocked with a big spice rack and had all the items we need to cook every day. We literally didn’t need to worry about anything. We stayed at a different 1 bedroom unit 2 years ago at Maui Kamaole and it was not as nice. I highly recommend this unit-thank you! I also recommend baby rentals from Nokaoi baby rentals. We would like to express our gratefulness for your kindness as well as this wonderful condo. We enjoyed the private lanai as well as the exceptional cleanliness and comfort of this condo. Love the updates! Cara it was so good to meet you in person this time. It’s always so good to be able to put a face to the name. We both look forward to coming back in December to enjoy another wonderful stay at your other condo again at the Palms with our adult grandchildren. Mahalo. Aloha Cara & Sig, this was our 2nd time in your condo. It felt like home when we walked in. We love your renovations, all is so perfect, clean, so peaceful and love how stocked it is. We really had everything we wanted and more. Mahalo. Maui Kamaole I-103 is super clean, comfortable, close to the beach, close to shopping, quiet and has enough of an ocean sunset view that you don’t need anything more. We occasionally walked down to the water to see the full-on setting sun but from the comfort of our patio usually watched the changing colors in the sky in private. (Cara note: seeing the sunset from the lanai is a seasonal thing. At other times of the year you cannot see the sunset from the lanai). We were right back out with our coffee every morning to see the stars disappear into the dawn sky and listen to the birds start their day. The swimming is good at Kamaole III and only a few minutes walk down the hill. More lovely beaches just a short drive into Wailea. The weather was almost perfect sun every day in spite of gloomy forecasts for much of Maui. This condo is very close to the pool, spa area in the complex where there are several BBQ’s that you can grill on should you choose to do so. There are more as well in the parking lot that are available for grilling as well. It is extremely clean, and unbelievably quiet. Sitting on the lanai some evenings you could hear a pin drop. There are several nice beaches very close by to spend the day at or to walk over and watch the amazing sunsets! We could also walk to quite a few different restaurants to dine or just enjoy happy hour and socialize. You do need a car though to go see the attractions on the island but parking off road is provided with the condo. I would definitely stay there again. We had an amazing stay in Cara’s condo. This was our second visit to Kihei and the proximity of the condo to the beaches, restaurants and parks is a great advantage. Just a 5 min drive. The condo was well maintained with nice upgrades. Everything was very comfortable. We made good use of the beach chairs, cooler, snorkeling gear and kids beach toys that were made available. Being a ground floor condo, we spent a lot of time in the Lanai (with a nice ocean view) while our 3 year old kept himself busy scurrying around the garden. My husband and I celebrated our honeymoon in this condo about a week ago. It was everything we could have asked for. The place was very clean and very well maintained. The new bathroom and kitchen were beautiful! There were beach chairs, coolers, boogie boards, snorkel gear, flippers, etc. that we could use! The resort grounds were very quiet and beautiful. There were two pool areas and the beach was about 5 minutes away. Cara and Sig were VERY easy to work with and were very excited to share their home with us. I really can’t say enough about this condo. It is everything we could have asked for and more for our honeymoon and first time in Maui! Mahalo! I would like to say a big thank you to the owners. This condo is beautiful and they thought of everything, it even had detergent cleaning gear and a few herbs and spices which is the last thing you want to purchase while on holidays. The unit also has beach chairs and other recreational items to enjoy your day out at the beach. The bathrooms are fantastic clean and spacious. Everything has been thought of and its a home away from home. Location is brilliant nice quiet area but central to the best snorkelling in Maui. Unit is opposite the boat ramp if your wanting to go on a snorkelling/diving tour. Lovely swimming pool, the grounds are spacious. I would highly recommend this place. Thank you for sharing your home once again. We found your re-do of your condo enjoyable. In particular the ‘new bathroom’. Great location and the place was perfect for the two of us. We had a wonderful holiday and would not hesitate to book I-103 again. 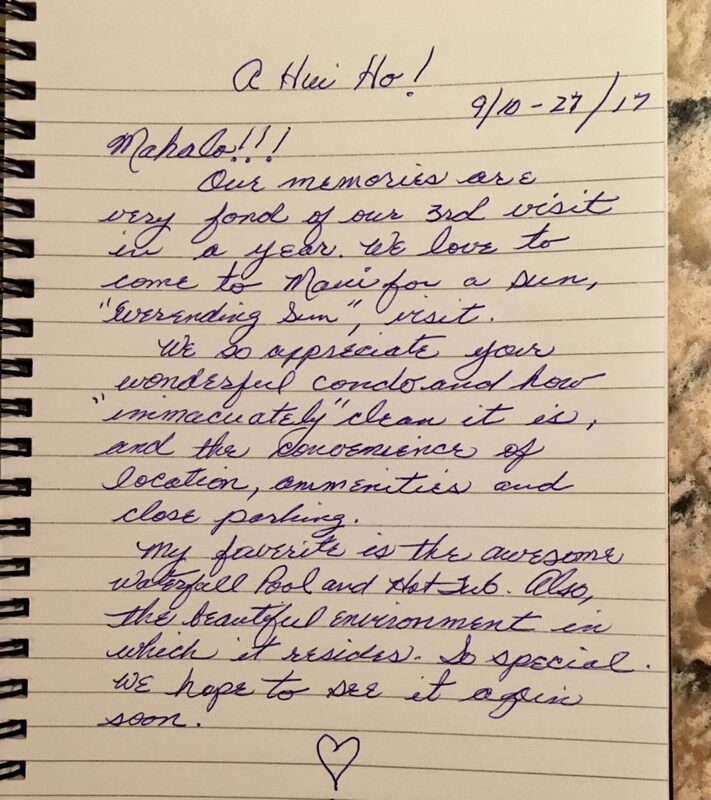 My husband and I stayed in Maui Kamaole I-103 in February 2017. From the very beginning, Cara was extremely helpful and very quick to respond. We searched many different complexes and units and upon arriving at the unit, we were VERY happy with our choice. It’s an amazing unit, location, and complex for the price. The unit is spacious, clean, private, and has a beautiful view. It’s within walking distance of the main shops in Kihei and only a 1-2 minute drive from Wailea. I would highly recommend this unit and working with Cara to anyone interested staying in South Maui. This unit would be perfect for a small family or even two couples. We will be returning to Maui and Cara will be the first person I call for our lodging needs. This was our first time in Maui and staying at Cara’s condo helped to make the trip absolutely perfect. The condo is incredibly clean, bright, open and spacious. Everything we could want was there for us and our 15 year old son — all the extras — from household items (colander, blender, cling wrap, and toothpicks!) beach gear (chairs, boogie boards, towels, pool noodles and umbrella!). The condo exceeded the expectations we had upon booking and Cara was an absolute delight to deal with. The grounds and back lanai were gorgeous – the view is lovely. The location of this complex in Maui allowed us to travel around walking to the beaches or driving to a restaurant easy and straightforward. You will not regret staying here! We can’t wait to return. Mahalo Cara! We stayed at August 2016 for 7 nights. We loved the place. The rooms and lanai were comfortable, the kitchen was fully equipped with all things, little details like boxes or zip-lock bags. The beach gear was great. This condo met all out needs and surpassed our expectations. The add didn’t mention the pull out couch and that was a bonus when we arrived on top of the available Murphy bed, two great bathrooms and a nice location near all the stuff we love to do. Perfect for four to five people. Cara was amazing, and made sure all our needs were met with plenty of resources about the condo and Maui. We cant thank you enough!!!! We are returning renters to this beautiful condo at Maui Kamaole. It works very well for our family of four. We love the lanai for morning coffee and evening relaxing at the end of the day! Great location and beautiful grounds. It has all that we need. Cara is a great host and we appreciate the care they put into their properties and to make sure we have a great stay. pools are very nice and the beach is so close. We hope to get back to Maui again and would stay here a third time! Lush beautiful grounds. Overall sense of privacy. Clean and well kept. Well equipped kitchen. High quality mattresses. Excellent air conditioning units. Lanai offers a view of the ocean. Quick access to many beaches. We’ve stayed several places around the island and loved this place. Often Maui condos have long narrow floor plans and small lanais. Loved that this condo had a super wide living area with glass wall and sliders to a large private patio where there was always somewhere shady or sunny to sit. Loved sitting out in the morning and watching the birds walk around and sing. Other highlights of the condo were the extra comfy king bed in the master – perfect level of firmness for me, and also not bouncy so you don’t get woken up by the other person rolling over! I’m picky and this bed was great. Also the condo seemed very soundproof, did not hear any TV or talking from our neighbors! Finally, the owner is local which is great. One day we had a injured bird on our doorstep and Cara got someone over to take care of it in an hour. I have had past experiences with non-local owners and having to call other time zones to deal with issues and it was not great. This was super convenient. Also, the condo was really well-stocked with beach equipment. 2 full-size boogie boards, 4 backpack beach chairs,etc., in very good condition. Loved this! We are a family of three with a teenager, and he really enjoyed the comfort of the murphy bed. much better than the usual pull-out sofa, and easier to put away in the morning. Another little thing: the lock is a keypad! Can’t tell you how convenient it was not to have to carry keys around. I want to get one for my door at home! Lastly, Maui Kamaole really has nice facilities. Excellent pools that are a good size! Nice new BBQ grills. beautiful plantings and lots of birds. And an easy walk to Kamaole lll beach. I really liked not having to go to a hotel beach (i.e. Wailea Beach) . Kamaole III was wonderful. 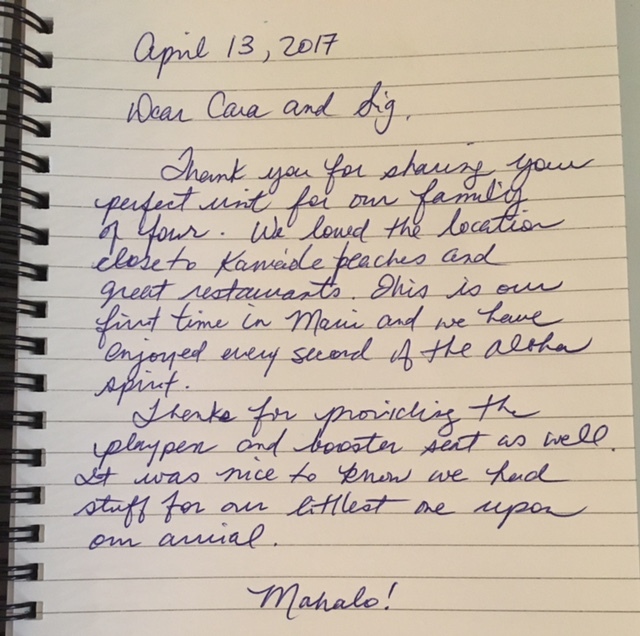 Thanks so much, we will book with you again. Our second stay here in this beautifully updated condo. Love the two bathrooms and laundry facilities. This place is amazingly super clean. You can tell the locally – owned owners take great pride in their property. The condo is in a very quiet complex, private lanai to enjoy coffee in the morning. You can even enjoy a small view of the ocean. I would have no problem returning for my third visit to this great place some day! This condo was an added bonus to being in paradise! It was perfect in every way. Cara and Sig were great hosts and welcomed us with coffee and macadamia nuts and had all the necessities we needed to make our holiday awesome! Any questions we had they were more than helpful and gave us great suggestions on what to see and where to eat. It had everything we needed to cook our own meals, even all the bbq utensils. It is so big and comfortable. We truly loved our view and the privacy that we had on our lanai. The grounds are so well kept and beautiful. The pools and hot tubs are great, each one is a little different. Our favorite is the higher one with all the tropical plants surrounding you. Beaches are close to walk too, and even more fun with the boogie boards and mats and coolers to help make it that much more enjoyable. It was all A plus! We had many family members here as well for a holiday and all 30 plus of us attended the luau at the Marriott in Wailea it was an very memorable evening. We were treated fantastic, we all felt so special right down to the 2 years-olds who were able to dance on stage. MAUI is home, we love it and will be back again. Thanks again Cara and Sig. This condo was perfect for our 4 night stay. Cara was an amazing host, and I didn’t even meet her! She left us coffee, macadamia nuts and a few chocolates to get us started. The condo was so convenient to access (door code) and fully equipped with everything we needed, all we had to buy was food. The kitchen is fully stocked with spices, sugar, sandwich bags, aluminum wrap, dishwasher tablets, and all the staples. There is a coffee maker, toaster, kettle, dishwasher, and best part… an amazing set of sharp knives! The condo is really spacious, with a big lanai (ground floor), 2 bathrooms, 1 bedroom and a pull down cupboard bed in the living room. Lots of entertainment provided, 2 TV’s, books, DVDs, boogie boards, tennis rackets, beach umbrella, chairs, mats, etc. The beach is a 5 minute walk away, and the condo pool area is right next door, with barbecue facilities, snack & drink vending machines, a pool and hot tub! There is a better pool area further up into the complex which has a rock pool & hot tub with lots beautiful trees and plants around. The area is also nice and near Wailea, shopping & restaurants. Kihei is also a great starting point for exploring the rest of the island, Haleakala Volcano, Drive to Hana, etc. Would definitely recommend this place, comfortable for at least 4 people. This spacious condo was a restful place to get away during our stay in Kihei. Cara and Sig thoughtfully provide all the necessities and then some! We really appreciated the kitchen and BBQ areas for making our own meals, and it is close to visit some of the great restaurants nearby. (Cafe O’Lei was a favorite) We really loved the coffee machine and grinder and were able to enjoy many great cups of coffee on the lanai, enjoying our ocean view and the park-like grounds of Maui Kamaole. We were thankful to be able to use the air conditioners once in a while when it got really humid (one in the bedroom and one in the living area). The hallway closet provided all the basic beach equipment we needed that week — plus boogie boards! It was fun to try boogie boarding in the ocean at Kamaole III beach, which is an easy, few minutes’ walk from the condo even carrying the boards. We snorkeled at Keawakapu beach, a few minutes down the road the other way, and saw many amazing fish that we had previously seen at the Maui Ocean Center. I would highly recommend visiting the aquarium first so you can identify all the fish you see! Overall, this was a very restful week, in a super quiet condo, with all the comforts of home… we did not want to leave, so we will definitely be back!